First Language Lessons, written by Jessie Wise (co-author of The Well Trained Mind), is essentially a day-by-day, word-for-word, activity-by-activity script for the parents. It contains everything you need for 1st grade: memory work, stories, copy and dictation work, narration, and grammar. It even contains reminders to praise and encourage your child! 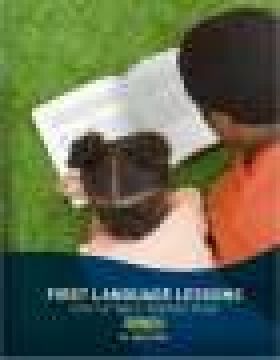 First Language Lessons 1 by Jessie Wise (new edition). Picture this: You curl up on the couch with your 6-year-old, a soft afghan covering you both. You each have a couple of cookies to nibble. The two of you are engaged in a conversation about (of all things) direct quotes. Your child giggles uncontrollably as together you read the story of the Little Red Hen. Your cozy conversation segues into a discussion about titles of resect and how they are punctuated. You smile at your daughter and stroke her hair, then ask her a tough question: Does she remember the definition of an adjective? She excitedly spouts off the definition. You praise her, kiss the end of her nose, then continue on with the next part of the lesson. This deliciously cozy, yet classicly thorough approach to language arts is perfect for building not only solid educational foundations, but educational delight as well. First Language Lessons, written by Jessie Wise (co-author of The Well Trained Mind), is essentially a day-by-day, word-for-word, activity-by-activity script for the parents. It contains everything you need for 1st grade: memory work, stories, copy and dictation work, narration, and grammar. It even contains reminders to praise and encourage your child! As Jessie (author) says, "We can grow children who exceed the average by exposing them to above-average content - as long as that content is taught patiently, frequently, consistently, and is reviewed often." And, I might add,..."in an environment where the child feels loved." I applaud this book and its approach to language arts for children. Level 1 has the same great content as the original edition, along with new picture narration lessons. It has been redesigned for clarity and ease of use. Lessons follow the same order as the original edition. For a sample lesson, click on the Attachments tab above.